Gentle care formula soothes, calms, and de-stresses scalp while cleansing and removing impurities from the scalp and hair. 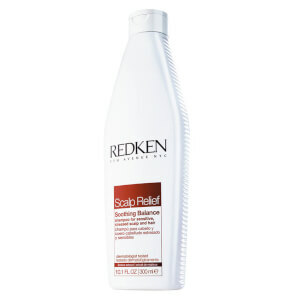 It is formulated with Redken's exclusive Calming Suspension System technology utilizing eucalyptus and liquorice extracts to help gently soothe, calm and de-stress while moisturizing, refreshing and rebalancing the scalp. Relieves scalp tension and tightness while providing scalp equilibrium. Apply to your wet hair. Eucalyptus and liquiorice extracts = instant calming, soothing, and relief of sensitivity and scalp stress.